Consider movement in the context of sport, requiring elements of skill, athleticism and training. Proficiency in the sport of movement with specific competence in the domains of coordination, mobility and strength is likely to impart an advantage in preventing and recovering from non specific low back pain (NSLBP). 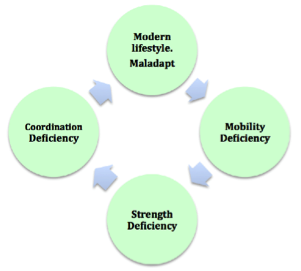 Conversely, if our modern industrialized society actively suppresses proficiency in the skill domains of this critically important, “sport of movement”, of which every individual mandatorily must participate, one could postulate that this may be the root cause of NSLBP and logically should be the primary first line therapeutic target. This theory has been tested prospectively with profound success at two Functional Movement Training Centres in Brisbane, Queensland, Australia, applying distinctive movement training techniques. The success therein justifies further robust research to affirm and replicate these promising results. Is Non-Specific Low Back Pain (NSLBP) A Problem in Our Society? Why Is LBP So Prevalent and Costly? 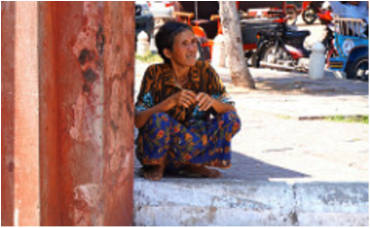 Disease prevalence relates to increased occurrence, decreased treatment, or more concerningly, both. Increasing occurrence may be attributed to increasing rates of sedentary behavior or diabesity. However, despite being at a dramatically low level, on average engagement in exercise has increased while LBP prevalence has increased, suggesting that under-exercising itself is unlikely to be a cause.4 Chronic LBP, unlike many other chronic conditions, is associated with consumption of a multitude of other health resources unrelated to the condition itself and supports an eight-billion and fifty-billion-dollar treatment-based industry in Australia and America, respectively. Yet, poorly efficacious treatment paradigms could well be an explanation for the increasing prevalence.5 A clear distinction between non-industrialized societies with less LBP, is the functional requirement of individuals. In order to meet the functional requirement of their lifestyle, a high functional capacity is maintained.6,7 It follows that a high functional capacity can only be maintained in the presence of movement proficiency. There is no place for chronic muscle tightness, immobile joints, or a weak posterior muscular chain in these societies. What are the Common Treatment Paradigms? Currently there are three accepted, but not necessarily effective treatment paradigms, for LBP. These include prescriptions for rest/time off work, NSAIDs, opoids, massage, acupuncture, and spinal cord pain pathway modulating surgery (i.e. neurostimulation). These include surgical fusion of an unhealthy appearing disc or an extremely degenerate spinal segment. Injections into inflamed facets joints or around lumbar disc annular disruptions. These include gym-based exercises, Pilates, yoga, chiropractic, physio-guided motor control exercises–all of which aim to purposefully add a layer of control to the musculo-ligamentous and spinal integrity. Are These Treatment Paradigms Effective? 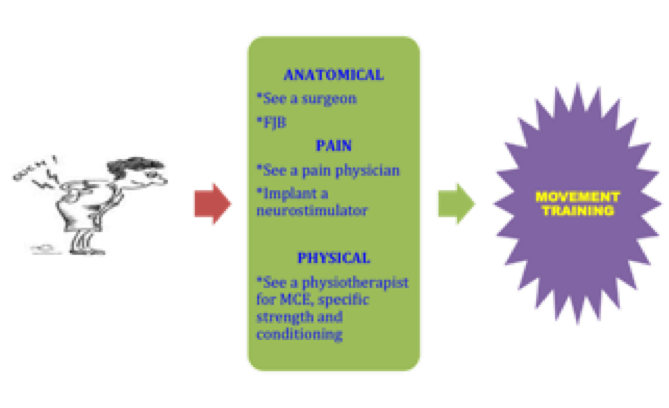 Similarities can be drawn with neurostimulation pain management surgery and medical therapy. If any improvement at all, it is early on and the tendency is for a decline in benefit or a need to escalate analgesic drug therapy with time. LBP appears to break through the walls of existing symptom-based treatment paradigms, suggesting persistence, inattention and ignorance to the underlying causation of LBP. Physical therapies are instinctively critical, for treating low back pain given the non-conjectural understanding that pain causes abnormalities in muscle electromyographic studies. Atrophy and weakness in spine stabilizing core muscles is obvious clinically and radiologically.11 Disappointingly, when subjected to the rigour of randomized control trials, physical therapy, has unimpressive medium and long term outcomes. Even with short-term outcomes, if clinical and statistical significance is to be found control arms of essentially “no intervention” are required.12 We as practitioners, are then faced with a common unifying question: Is this the best that billions of dollars spent on conventional first line physical therapy for low back pain can produce? To create a new treatment paradigm we should address the root cause of nociception and pain, and remove the focus from potential anatomical nociceptors such as discs, joints, bone, muscles, ligaments and dura.13 It has been proposed that if perceived pain generating tissue is to be the target of surgery, a clear understanding of the cause of such surgical targets must be identified before performing surgery.11 Poor movement form and associated microtrauma are the root cause suggested by Sahrmann and Mcgill. 14,21 It bodes poorly then, that current styles of dedicated motor control and movement pattern therapy have failed to adequately address NSLBP in unselected cohorts.20 Identifying a common factor associated with successful treatment outcomes would be a powerful guide to developing a more effective generic therapeutic approach for NSLBP. Surely LBP is not such a heterogeneous condition that treatment needs to be so precisely and individually tailored to achieve a positive outcome? These authors posit that by looking to societies with high functional capacity and low rates of LBP we might find the common factor preventing, and therefore reversing LBP. Sport implies among other factors, a degree of skill acquisition, intensity, athleticism and competition. Rehabilitation for LBP can be appreciated as a sport with similar requirements and benefits of learning new skills and developing athleticism. Excelling at the “sport of movement” is a priority for all individuals given that we all participate in this sport. In relation to LBP, being poor at the “sport of movement” of the lumbo-pelvic spine very likely results in transformation of normal painless degenerate spinal structures into pathological nociceptors or “degeneritis”.14 Logically, if an individual is poorly skilled in this “sport” and predictably develops LBP, receiving treatment such as surgery, medication or physical strengthening will not automatically impart skills in the “sport of movement.”. Intuitively, this could account for the very high failure rates associated with treatments that do not incorporate an element of training in the “sport of movement.” In a similar tone, if there remains a level of competency in the sport of movement that permits reacquisition of functional capacity that meets the functional requirements for that individual, treatments for LBP can on occasion be successful. Therefore it can be concluded that cultures with low levels of LBP can surely be attributed to the fact that even with the high physical demands of their lifestyle, they retain skill in the “sport of movement”. Figure 2. Movement involves 3 Elements: Coordination, Mobility and Strength. Modern lifestyle and maladaptations compromise this in an increasing cyclic manner a characteristic seen less often in non industrialized cultures. Compound movements (involving multiple joints moving through a wide range of motion). Movement initiation is derived or initiated primarily slowly and powerfully from the central core muscles all of which have a roll in stabilizing the spine with an inversion of the power and velocity relationship as the movement progresses to the extremities. It is a natural movement that is programmed into our neural circuitry – hardwired, so to speak, from our DNA. This is obvious in the way that an infant will learn to walk and perfectly drop into a squatting position without specific teaching or guidance. A bird begins to flap its wings naturally; a snake begins to slither. These are functional movements that specifically belong to the species. We as humans also have our own set of functional movements that can either be optimized and utilized in everyday activities or they can degenerate and be lost to maladaptations with the subsequent development of fragility and pain. It is an irreducible movement. No amount of practice of individual components of the movement can circumvent the benefit of actually practicing the movement in total. The most important aspect of a functional movement is that it has the unique ability to, relatively, move larger loads, longer distances, in a shorter space of time. This equates to a unique ability to generate power and functional capacity. Power and functional capacity is also an expression of intensity. Engaging in functional movement training mandates the development of a relative high intensity rehabilitation that is missing or even avoided in other forms of LBP physical therapy. The foundation of Functional Movement Training (FMT) is based upon treating causation, not symptoms. FMT requires that movement obstructing barriers (MOB) be addressed as part of the overall management and this may require dedicated motor control or core stability exercises with a physiotherapist or pain medication supervision through a pain physician or surgery from a spinal surgeon. Figure 3. 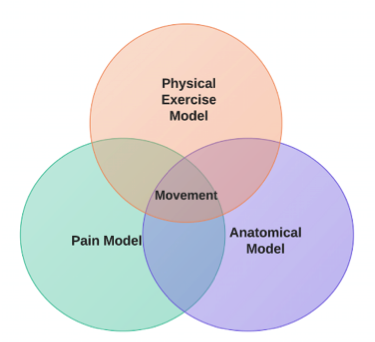 The ultimate goal of all 3 conventional treatment paradigms should be to enable the potential to regain sound movement through the practice of Functional Movement Training. What is Relative intensity and why is it important in Functional Movement training? Functional movement inherently permits the development of relative high-intensity rehabilitation that is missing or even avoided in other forms of physical therapy. A characteristic of a functional movement is the ability to move loads longer distances quickly which is consistent with the mathematical formula for average power, which is F(load) x Distance(the distance that the load is being moved) divided by Time (the time it takes one to move the load that distance) (Power=FxD/T). Many conventional low-intensity rehabilitation exercises avoid Functional Movements and therefore avoid intensity, and thus fail due to inadequate neuro-hormonal adaptive responses. These conventional exercises, stretches and recumbent passive activation movements also lack the ability to optimize functional core stability in real world movement and do not promote favorable strength and conditioning adaptations. Non-functional movement training is, however, easily tolerated passively by the client and administered with minimal effort from the standpoint of a therapist. How Can Functional Movement Training Be of Benefit To Patients? The general population of LBP patients are often patients who have dealt with pain for a long time. Frequently, numerous treatment modalities targeting symptoms, not causation have been employed and failed. Conventional therapies have failed to employ adequate relative intensity functional core stabilization and neuro endocrine adaptive methods, but rather favour low-intensity passive motor control and mobility approaches. Post operatively: A patient may have a movement obstructing barrier such as a lumbar disc prolapse, canal stenosis or instability that is addressed with surgery. However, the surgery in itself does not restore the movement deficiencies that evolved preoperatively. Often, and directly related to the chronicity of LBP, these movement deficiencies will cause significant neurological entrenchment to occur. This is hypothesized to be a major inhibitor of optimal recovery from surgery and may, in part, explain the “diagnosis” after surgery referred to as failed back surgery syndrome. Similar outcomes are also seen when patients report effective resolution of lower limb pain after surgery due to neural decompression, despite minimal reduction in, or worsening of LBP symptoms. The “failure” in fact is less likely to be the surgery or the patient, but more likely because efficacious movement training utilizing Functional Movement was neglected. Preoperatively: Prior to considering surgery, patients may wish to trial a period of nonsurgical management for conditions that are irritating but not critically affecting them. Engaging in FMT gives the patient maximal potential to continue to move with sound biomechanics, further stabilize the fragile spinal segment. These benefits maximize the potential to heal spontaneously and possibly avoid the need for surgical intervention altogether. Prospective Audit of outcomes from two Functional Movement Training Centre’s: Two dedicated Functional Movement Training Centres in Queensland, Australia applying the same treatment principles for 200 consecutive patients with NSLBP prospectively collected outcome data between 2015-2016. All patients referred to the program were referred by one neurosurgeon and were deemed to have NSLBP for at least 3 consecutive months. All patients had undergone a multitude of other “first line” treatments including physiotherapy, analgesics and reduction in usual physical activities. A prospective survey was administered to 50 consecutive patients enrolled in the program (Item 1). 40 patients completed the survey and completed at least six of the eight-week relative intensity Functional Movement Training program. Of the randomly selected patients who completed the program, their results were quantified and interpreted within the context of the aforementioned survey. 90% indicated improvement in functional capacity. 2 patients indicated ongoing pain flares with increasing work capacity and 1 patient indicated no improvement in work capacity but a 40% reduction in LBP. 100% of patients indicated an improvement in LBP per the ‘Low Back Pain Assessment tool’, with one patient even anecdotally reporting a ‘110%’ improvement. The lowest improvement in LBP was 20%. Concerning the knowledge, self-directed LBP management and prevention assessment, 100% of patients gave this section the maximal score and 3 patients were no longer engaging in the learned exercises. Lastly, concerning the functional movement program assessment, 100% of patients gave a maximal score. The existing physical and biopsychosocial paradigms for treating LBP are blatantly ineffective at controlling the increasing prevalence of this disease. 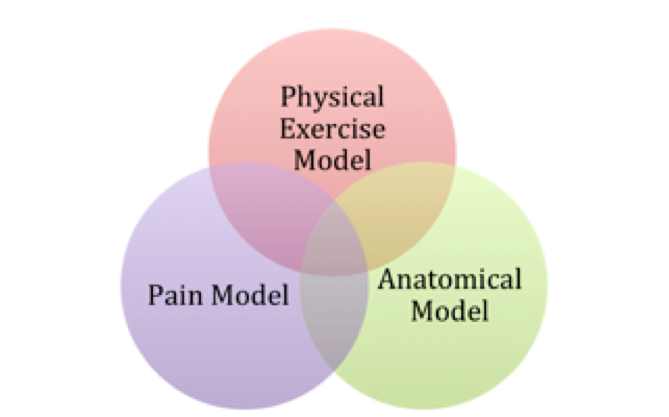 Although sound hypotheses that pain with associated entrenched movement dysfunction are well supported in the literature, physical therapy including active and passive modalities and symptom-based therapy such as pain management and surgery to arrest the condition have been disappointing when subjected to randomized control trials. Surgical fusion is increasingly under scrutiny as a treatment option at all for NSLBP. We propose that a conceptual shift in understanding that the goals of existing NSLBP treatments including surgery, pain management and physical therapy are not to cure NSLBP but are merely important and necessary stepping stones to enable the potential to engage in specialized Functional Movement Training at Relative Intensity. Currently, this relative intensity movement training appears to be distinctively avoided in LBP rehabilitation programs and we believe is the missing link required for patients to regain proficiency in the “Sport of Movement” and subsequently resolve NSLBP. Our 50 patient prospective survey of outcomes from two dedicated Functional Movement Training Centres in Queensland, Australia have demonstrated resounding success that further justifies randomized controlled trials cementing this unique mode of treatment as mainstream therapy to arrest the growing epidemic of NSLBP in the industrialized world. American College of Sports Medicine. ACSM’s Resources for Clinical Exercise Physiology: Musculoskeletal, Neuromuscular, Neoplastic, Immunologic and Hematologic Conditions, 2nd New York: Lippincott W&W. 2009: 175-176. Freburger J, Holmes G, Agans R, Jackman A, Darter J, Wallace A, Castel L, Kalsbeek, W, Carey T. The Rising Prevalence of Chronic Low Back Pain. Archives of internal medicine. 2009;169(3):251-258. Hoy D, Brooks P, Blyth F, et al. The epidemiology of low back pain. Best Pract Res Clin Rheumatol. 2010;24:769–81. Walker B, Muller R, Grant W. Low back pain in Australian adults: the economic burden. Asia Pac J Public Health. 2003;15(2):79-87. Lopez A, Mathers C, Ezzati M, Jamison D, Murray J. Global and regional burden of disease and risk factors, 2001: Systematic analysis of population health data. Lancet 2006, 367:1747-57. Fritzell P, Hägg O, Wessberg P, Nordwall A; Swedish Lumbar Spine Study Group. 2001 Volvo Award Winner in Clinical Studies: Lumbar fusion versus nonsurgical treatment for chronic low back pain: a multicenter randomized controlled trial from the Swedish Lumbar Spine Study Group. Spine (Phila Pa 1976). 2001 Dec 1;26(23):2521-32. Hedlund R, Johansson C, Hägg O, Fritzell P, Tullberg T; Swedish Lumbar Spine Study Group. The long-term outcome of lumbar fusion in the Swedish lumbar spine study. Spine J. 2015 Sep 9. pii: S1529-9430(15)01371-6. Atkinson L, Zacest A: Surgical management of low back Med J Aust 2016; 204 (8): 299-300. Hodges P, Cholewicki J, Dieen J. Spinal Control: The Rehabilitation of Back Pain, 1st New York: Churchill Livingstone; 2013:60,68,69,84.
van Middelkoop M, Rubinstein S, Kuijpers T, Verhagen A, Ostelo R, Koes B, van Tulder M. A systematic review on the effectiveness of physical and rehabilitation interventions for chronic non-specific low back pain. Eur Spine J. 2011 Jan;20(1):19-39. Bogduk N. Clinical Anatomy of the Lumbar Spine and Sacrum, 3rd New York: Churchill Livingstone; 1997:187-213. Sahrmann S. Diagnosis and treatment of movement in impairment syndromes. St Louis: Mosby 2001:6. Gaesser G, Angadi S. High-intensity interval training for health and fitness: can less be more? J Appl Physiol (1985). 2011 Dec;111(6):1540-1. Godfrey R, Madgwick Z, Whythe G. The Exercise-Induced Growth Hormone Response in Athletes. Sports Medicine. 2003;33(8):599-613. Blasio A, Izzicupo P, Tacconi L, DI Santo S, Leogrande M, Bucci I, Ripari P, D Baldassarre A, Napolitano G. Acute and delayed effects of high intensity interval resistance training organization on cortisol and testosterone production. J Sports Med Phys Fitness. 2016 Mar;56(3):192-9. Peake J, Tan S, Markworth J, Broadbent J, Skinner T, Cameron-Smith D. Metabolic and hormonal responses to isoenergetic high-intensity interval exercise and continuous moderate-intensity exercise. Am J Physiol Endocrinol Metab. 2014 Oct 1;307(7):539-52. Tremblay A, Simoneau J, Bouchard C. Impact of exercise intensity on body fatness and skeletal muscle metabolism. Metabolism. 1994 Jul;43(7):814-8. Macedo L, Maher C, Latimer J, McAuley J. Motor control exercise for persistent, nonspecific low back pain: a systematic review. Phys Ther. 2009 Jan;89(1):9-25. Mcgill S, Grenier S, Bluhm M, Preuss R, Brown, Russell C. Previous history of low back pain with work loss is related to lingering effects in biomechanical, physiological, personal and psychosocial characteristics. Ergonomics 46, 731-746. Schenkman M, Jordan S, Akuthota V, Roman M, Kohrt W, Hearty T, Cleary C, Backstrom K. Functional movement training for recurrent low back pain: lessons from a pilot randomized controlled trial. PM R. 2009 Feb;1(2):137-46. Shimada H, Makizako H, Doi T, Yoshida D, Tsutsumimoto K, Anan Y, Uemura K, Lee S, Park H, Suzuki T. A large, cross-sectional observational study of serum BDNF, cognitive function, and mild cognitive impairment in the elderly. Front Aging Neurosci. 2014 Apr 15;6:69. Pengel L, Herbert R, Maher C, Refshauge K. Acute low back pain: Systemic review of its prognosis. BMJ. 2003, 327:323-325. O’Sullivan P, Lin I. Acute Low Back Pain: Beyond Drug Therapies. Pain Management Today. 2014: 1(1):8-13. Brito L, Ricardo D, Araújo D, Ramos P, Myers J, Araújo C. Ability to sit and rise from the floor as a predictor of all-cause mortality. Eur J Prev Cardiol. 2014 Jul;21(7):892-8.